Enbridge's Line 5 twin oil pipelines run under the Straits of Mackinac. A new report says the State of Michigan did not thoroughly review Enbridge’s ability to cover costs in the case of a spill from its twin Line 5 oil pipelines before it signed an agreement with the company. The pipelines run underneath the Straits of Mackinac. Water law non-profit “For Love of Water,” or FLOW, released a report saying both Wisconsin and Minnesota have hired experts to assess Enbridge's insurance on its projects in those states, but Michigan has not done the same. Skip Pruss, FLOW’s board chair, said that both assessments in other states found problems with Enbridge's coverage. Pruss called Enbridge's Line 5 insurance "likely deficient and inadequate," based in part on consultations FLOW had with the firm that did assessments in Wisconsin and Minnesota. Additionally, the report details six specific concerns with Line 5's spill coverage, including the dollar amount of insurance and whether it extends to Enbridge subsidiaries. FLOW released the report during a joint press conference with the group "Oil and Water Don't Mix" and the tribal chairman of the Bay Mills Indian Community, Bryan Newland. Newland spoke about his ongoing concern that a Line 5 spill would irreparably damage the ancestral lands of indigenous people in the area. "We enjoy a treaty right to use the waters of the Great Lakes for fishing for commercial purposes and also subsistence, and no amount of financial insurance is going to be able to replace that if it's gone," he said. "When the integrity of our sacred locations is disrupted, it can't be repaired by purchasing another place or by getting an insurance check." The Line 5 pipelines carry up to 23 million gallons of crude oil daily. "As part of the 2018 agreements with the State of Michigan, Enbridge provided the State with detailed financial assurances that we would cover all costs in the unlikely event of an incident in the Straits. Enbridge is focused on the Line 5 tunnel project which reduces the chances of any release into the Straits to near zero and reflects our steadfast commitment to protecting the Great Lakes, the environment, and the community, while safely meeting Michigan’s energy needs." Governor Gretchen Whitmer has asked Attorney General Dana Nessel to provide a legal opinion on the Line 5 agreements, which were made under the outgoing Snyder administration. 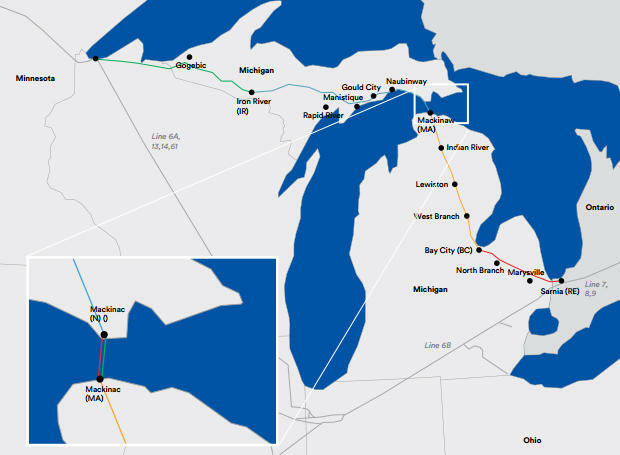 A tunnel for the Line 5 oil and gas pipelines in the Straits of Mackinac has its first permit. The Michigan Department of Environmental Quality issued it to Enbridge Energy on Tuesday. 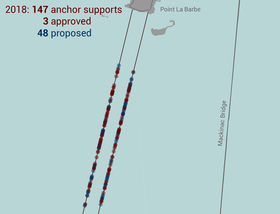 The permit would let Enbridge take soil and rock samples from the Straits. Company spokesperson Ryan Duffy says the samples will help them determine how to construct the tunnel.